BMW Group India has presented the 14th BMW Art Car created by most renowned British artist David Hockney for the first time in India. His creation will be exclusively exhibited from 31 January - 3 February 2019 at the India Art Fair in New Delhi. 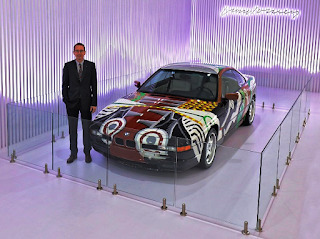 David Hockney created the 14th Art Car for BMW in 1995 with the BMW 850 CSi. The BMW Art Car collection was born when French race car driver and art aficionado Hervé Poulain, together with Jochen Neerpasch, then BMW Motorsport Director, asked his artist friend Alexander Calder to design an automobile. The result was a BMW 3.0 CSL, which competed in 24 Hours of Le Mans in 1975, where it quickly became the crowd’s favourite. Since then, 19 international artists have designed BMW models, among them some of the most renowned artists of our time: Alexander Calder (BMW 3.0 CSL, 1975), Frank Stella (BMW 3.0 CSL, 1976), Roy Lichtenstein (BMW 320 Group 5, 1977), Andy Warhol (BMW M1 Group 4, 1979), Ernst Fuchs (BMW 635CSi, 1982), Robert Rauschenberg (BMW 635CSi, 1986), Michael Jagamara Nelson (BMW M3 Group A, 1989), Ken Done (BMW M3 Group A, 1989), Matazo Kayama (BMW 535i, 1990), César Manrique (BMW 730i, 1990), A. R. Penck (BMW Z1, 1991), Esther Mahlangu (BMW 525i, 1991), Sandro Chia (BMW M3 GTR, 1992), David Hockney (BMW 85 0CSi, 1995), Jenny Holzer (BMW V12 LMR, 1999), Ólafur Eliasson (BMW H2R, 2007), Jeff Koons (BMW M3 GT2, 2010), John Baldessari (BMW M6 GT3) and Cai Fei (BMW M6 GT3). David Hockney’s art car tells a story. The imagery, flat and Matisse-like, narrates the emotional connection and singular bond between the driver and the vehicle. Hockney offers us a glimpse into the dynamics of the driver’s life: the car contains this personal story and is contained by it. The X-ray view of the interior of the car presents us a view of this connection. He turns the inside out, putting the technology of the BMW 850 CSi on the outside and making the bodywork seem transparent. The idea of showing the inside without damaging the outer shell. On the bonnet he paints parts of the 380 hp 12 – cylinder engine: big grey cylinders and huge round intake manifolds. He stretches stylised tyre treads, painted in black on white, far beyond the wheel arches, as if you are looking down through the metal from above. On the driver’s side there is a silhouette of a human figure in black and white. Its like the shadow of the driver on a canvas screen. On the passenger side, roof and trunk Hockney depicts a landscape. We can see a short stretch of grey road and lots of green, the lush rich green of California’s trees. Behind the silhouette of the driver is a white dog in an upright position. The dog is looking over the driver’s shoulder and out of the window. The Californian sun shines a powerful yellow and orange in the background. Hockney has lived in the United States, to be more precise Los Angeles, since 1964, creating the artistic oeuvre associate with his name today amongst connoisseurs worldwide – images of sunshine, swimming pools, palm trees and clear blue sky. He developed his own individual style of pop art which became as popular as that of Andy Warhol. Working in California, London, and in the course of his travels, Hockney focuses his attention on people and their environment. His portraits in particular highlight the individuality of their subjects, Hockney’s parents and Hockney’s friends. In the eighties, Hockney worked extensively with photography and in theatre design, two entirely different artistic challenges which fundamentally altered his approach and influence him until this day – even though Hockney has meanwhile returned to painting.